Native Californian with culinary dreams and novel aspirations. Places that feed my SOUL. Fancy Food Show - Part 2 of 3. Innovation is the benchmark of success. Innovation is the benchmark of success ... Well, I'm not sure who said it first or If I've just elevated myself to genius level, but that statement is so true in both our professional and personal ventures. The notion of how we move forward with new ideas is artfully crafted by the engine known as innovation. Also known as plain old reinventing ourselves. 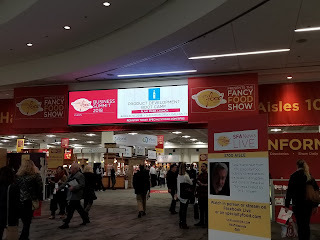 I met five culinary artist at the Fancy Food Show in San Francisco in January. All five took a standard idea that we have become accustom to and elevated it to a new food level. And each vision is better than you could imagine. So, let's not dilly-dally ... let's hop right into the first reinvention that caught my eye. Bread! Bread? That's not new... okay, but waitament (translation: wait-a-minute) before we jump on a bandwagon of mistrust. Hear me out. No, bread is not new. Even French bread is not new.... but, how its made, sold and delivered is new. If I want French bread I go to the local bakery or super market,. I meticulously press against the white waxy paper wrapper to see if there is a hint of crunch or the worst case scenario a hint of staleness. Fresh crunch, good sign. Next, I take a whiff and if it has the aroma of butter... it gets tossed in the basket. If there is even a hint of staleness or hard as a board ... then, my upper lip curls with disdain and it goes back into the dark depths inside the bin where it came from....hopefully only to see the light of day in a bread pudding or Italian panzanella. 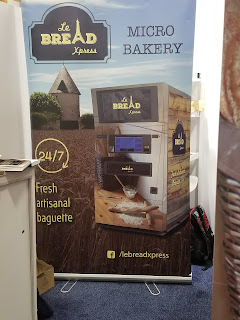 The innovative idea was to take the notion of technology, a mobile bakery and a vending machine and produce fresh, warm, spongy on the inside and crunchy on the outside best with brie baguette. I love a great idea made even better. Now, this might not be a notable idea to the wonderful people of France where boulangeries are well established businesses, on each corner or made fresh at home. But, in America the idea of a warm baguette made in minutes while I stroll around the market and pick up grapes, cheese, apples and wine on the way to the beach is almost like Christmas morning ... okay, I said, "almost". Sure the French beard in the grocery store is fine... but, it's room temperature ... and even cold. This baguette was still warm to the touch and made the brie melt slightly. Yes, it was heaven. To find out more about Le Bread Express go to https://www.lebreadxpress.com/. Next up, is pure genius. Nothing less. 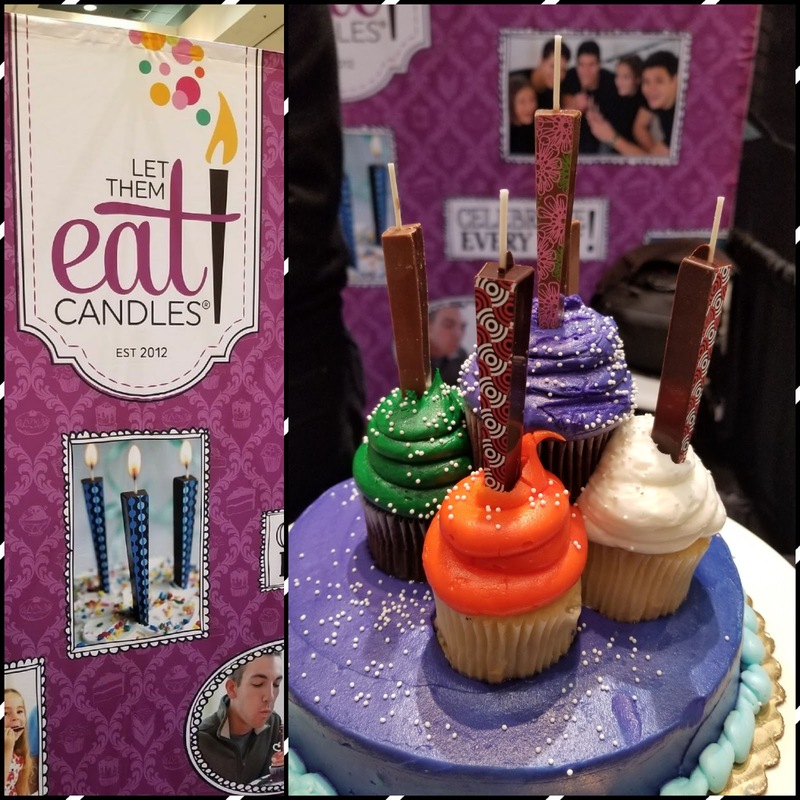 Candles .... wait for it ... that are edible. Nope you read that right ... the candles are edible. For years we have spent last minute runs to the store, or called a friend to pick up a pack or two for you on the way to your house, or scowered the "junk drawer" in the kitchen looking for waxy colorful candles to set on top of a cake or cupcakes for someone to blow out. I've done it. You've done it. Our friends have done it. Now, by design "Let them Eat Candles" has created edible chocolate candles. Don't worry the wick is real and doesn't melt the chocolate. They come in an array of colors to suit any celebration. Bonus, instead of people licking the icing off waxy candles... you know you've done it... you can keep licking away right down to the last nibble. This company is family owned and operated ... and bonus the Wife & Mother created the candles from a family experience. To check out more details go to http://www.letthemeatcandles.com/. The next product will have to ultimately change it's name. Because it won't be a "Little Secret" much longer. This is true innovation and quite brave. The candy industry is a hard industry to break into and what we have to choose from has been on the shelves for decades. Such as a popular candy that we all know and love M&M candy. Think of Little Secrets as an elevated version of that well known candy. Little Secrets are a hard candy coated drop the size of a small gun ball. They load flavor, upon flavor, upon flavor in a single mouthful. Sadly I have to admit ... I ate the entire bag of Sea Salted Peanut by my lonesome. They were delicious. More importantly they come in a variety of flavors to choose from in a generous size bag. Unique flavors such as toasted coconut, peanut butter, peppermint, raspberry and spiced pumpkin pie... just to name a few. 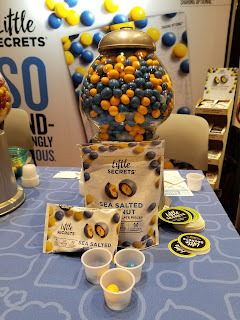 You can tell with each bite the candy was crafted from love, respect for the ingredients and a pure desire to put the best product possible in your mouths. I can imagine several ways to use Little Secrets. In cookie batter, as a gift for any holiday, toppers to cupcakes, ice cream, hot buttered popcorn.. a just to name a few. Most importantly, the product tastes like real chocolate that was just melted. To find out more about these lovely morsels go to http://sharelittlesecrets.com/. Okay, last one.... and not the least by any one's imagination. This was my favorite innovative product for the night. 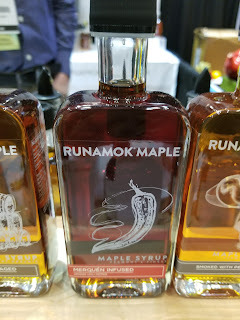 Runamok Maple... and the name suggests exactly what is in store. Maple syrup taken to another level. What I love about this product is from the bottle to the label to the ingredients inside much care and thought went into making the product note worthy. The classic bottle shape reminds me of the old fashioned flasks that you'd see in black and white movies. But, what is inside is so much more. The second thing I love about this product is the double duty it brings. While tasting the syrups not only did it have the classic real maple consistency, but it reminded me of food. Or at least what I'd serve or make with the syrup. The Pecan Wood Smoked Maple Syrup reminded me of Chicken and Waffles. The Ginger Root Infused Maple Syrup reminded me of a fresh summer cocktail. The Cardamom Infused Maple Syrup reminded me of spicy Indian curry over a bed of rice or coucous. Love a product that does double duty. 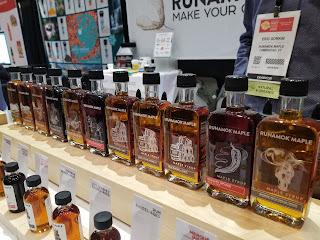 There are many flavors they highlight on their website found here https://runamokmaple.com/. This will become a staple around the house for enhancing flavor, sugar substitute ... or just because the bottles are so cool. That's the innovations line up. Hope you liked the article and that you try some of these products. You won't necessarily find them at your local stores, so take advantage of the on line discounts. Remember, cooking with love makes any recipe taste better ... and these innovative products are worth falling in love with. Labels: Places that feed my SOUL. Let's start with olive oils. For me olive oil is like sunshine after a rain... its essentials and always welcome. I use olive oil in my daily cooking, in salad dressings and an agent to boost flavor to most dishes. For some blog post readers who also view my Lady E Cooks Facebook page you might have seen my recent repost of how olive oil is made. The video featured the process of three granite wheels churning and crushing freshly picked olives (along with pits and leaves) into a rich paste. A process called cold pressed where the paste is pressed for hours causing the juice of the olive to drip slowly into vats. 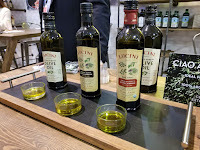 Ultimately the oil is separated from the water resulting in an "unfiltered olive oil". I'm sure there are a variety of ways to manufacture this golden liquid and for those who know me, knowledge is my "sweet spot" of happiness. But, in the end much like you...I just wanna grab a bottle off the shelf, crack it open and pour...lol.You might ask, but which olive oil is the one to buy? My answer to most questions is ...It depends. 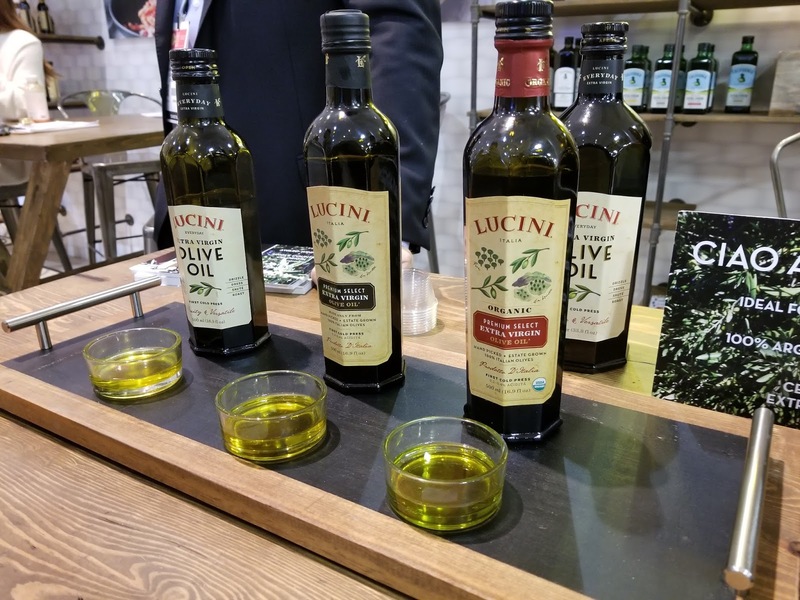 Lucini Olive Oil and California Extra Virgin Olive Oil. All of the olive oils mentioned above I personally buy and I have in my pantry. They each serve a different purpose for cooking and preparing meals. 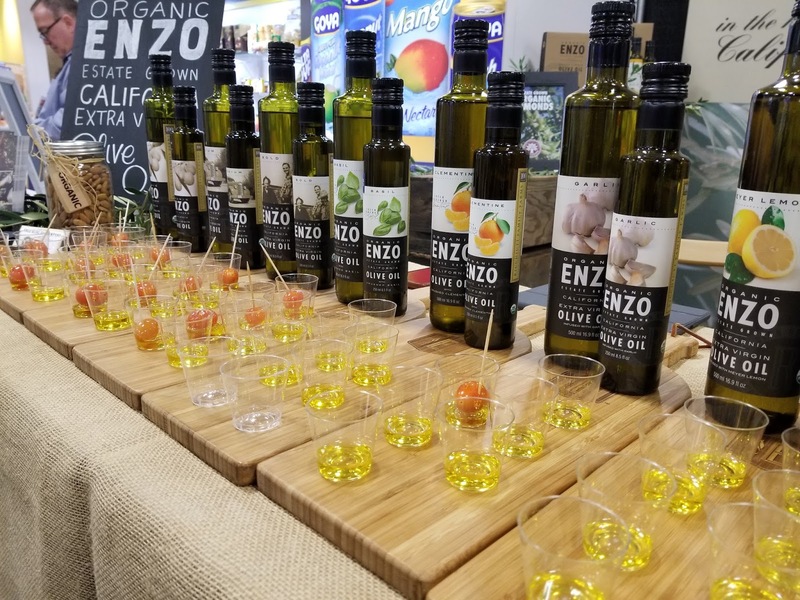 Enzo Olive Oil has a light flavorful note that pairs well with dishes highlighting fish, fruit or salad. I primarily use it to make herbed salads dressings. It has a fragrant flavor without being too overwhelming or sweet. However, it is flavorful unlike safflower oil or grape seed oil. Bonus, its reasonably priced. 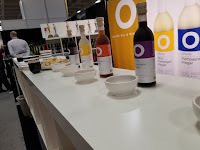 The olive oils shown in the photo are enhanced with either the essence of lemons, clementine or garlic which elevate all dishes that you prepare. I love having this option to experiment with all sorts of hot or cold food and these olive oils provide me that option. 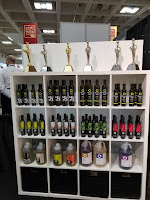 Excellent olive oil that is award winning and one of my favorites. 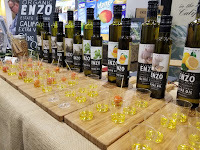 To learn more about Enzo Olive Oil go to http://enzooliveoil.com/ for details. Last, but certainly not least is my go to olive oil for searing, roasting, marinating and dipping sauces is Lucini Extra Virgin Olive Oil. I can't buy a bottle big enough to keep it in my cupboard. This is a rich, full bodied, heavy yet not greasy olive oil. I've tried to use it for salad dressings, but my preference is the lighter olive oils. It adds a richness that certain dishes require. For instances when I make my homemade pomodoro sauce ... the other oils are too light. This oil is perfect for long, slow, low heat cooking. Its rich enough to enhance the dish and bold enough to hold up to hearty herbs, like rosemary and whole garlic cloves. 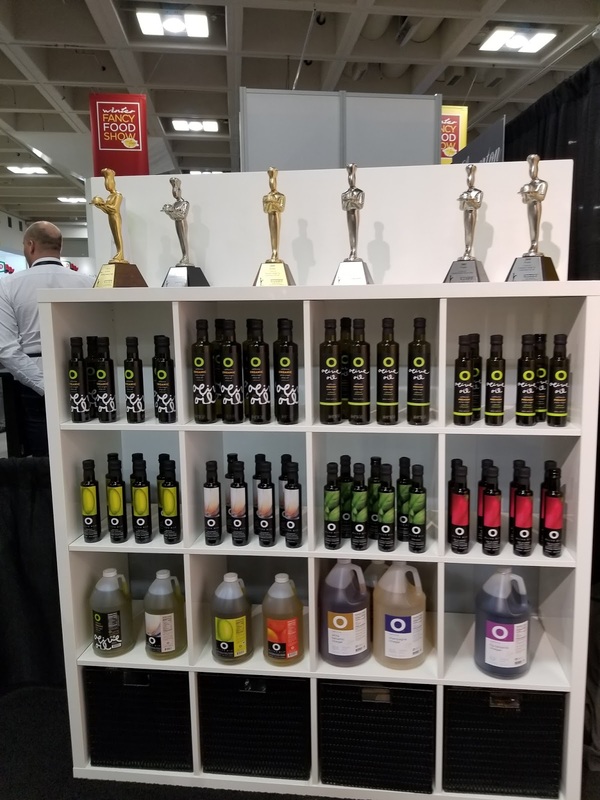 This company also makes a extra virgin olive oil called "California". One of my BFFs swears by this version of their oil. I prefer the Lucini ... but each to his/her own. To find out more about Lucini https://www.lucini.com/ see the beautifully designed website. Whichever olive oil you choose or how you choose to use it .... remember cooking with love makes any recipe taste better. The three day event held at the Mascone Center for the San Francisco Fancy Food Show consisted of thousands of vendors, manufacturers, owners, distributors down hundreds of isles located in two wings on two floors...Whew! Good thing I wore my walking shoes. Over 12K steps per day. Which is a good thing considering all snacks, candies, pastries, breads, cheeses and variety of meats I consumed. Sampling is a good thing, but after just two days I was desperately craving a salad. The displays are so beautifully designed and the vendors were so welcoming...especially once they saw the Press Pass. Found myself in many conversations about blogging and vlogging...and most of all cooking. In addition the Press Pass proved to open doors I've never seen or had access to at prior shows. 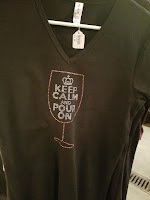 I'll be featuring several articles about new, innovative and creative culinary finds. In the meantime, you can watch the two YouTube videos by clicking on the link or entering Lady E Cooks in the search field. More to come. Until then, remember cooking with love makes any recipe taste better. 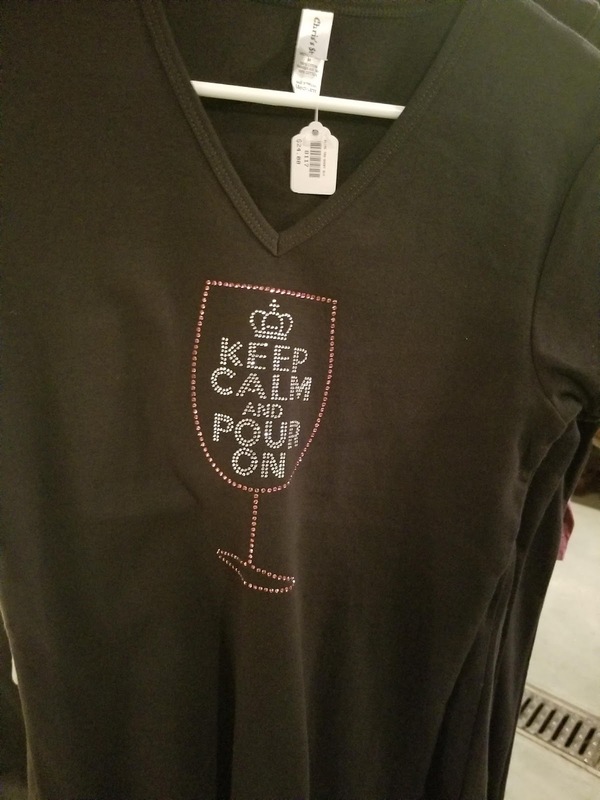 You know that moment when a fellow Californian, says "...Wanna go wine tasting..." and your ears perk up, a smile blossoms on your face and you calmly say, "...that sounds good...". When all the while your body is screaming ROAD TRIP!!! Yep, that was me while on vacation. 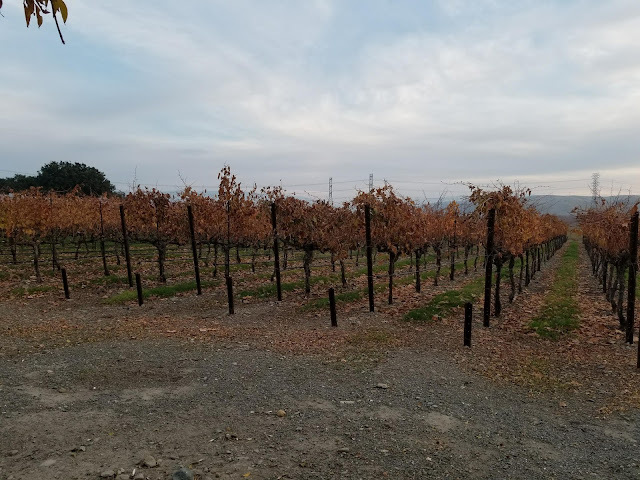 But instead of the Napa Valley route, which I love and highly recommend, we ventured to the relatively unknown second, Northern California wine country, City of Livermore. Before we dive deep into the story, I would like to explain, at least in my opinion, what's the deal with going to wine tasting??? There are three basic reasons to go to wine country. I call them my three "Es" ... Entertainment, Escape and/or Education. For me ... I was all about the educational aspect of the industry. My first experience, way...way back in late 80s, my job included traveling to different territories educating management and staff about lending. My northern most territory was the City of Napa. I know, how awful was that! Before then, I didn't think much about Napa until that one clandestine day after work I came across Domain Chandon Winery. 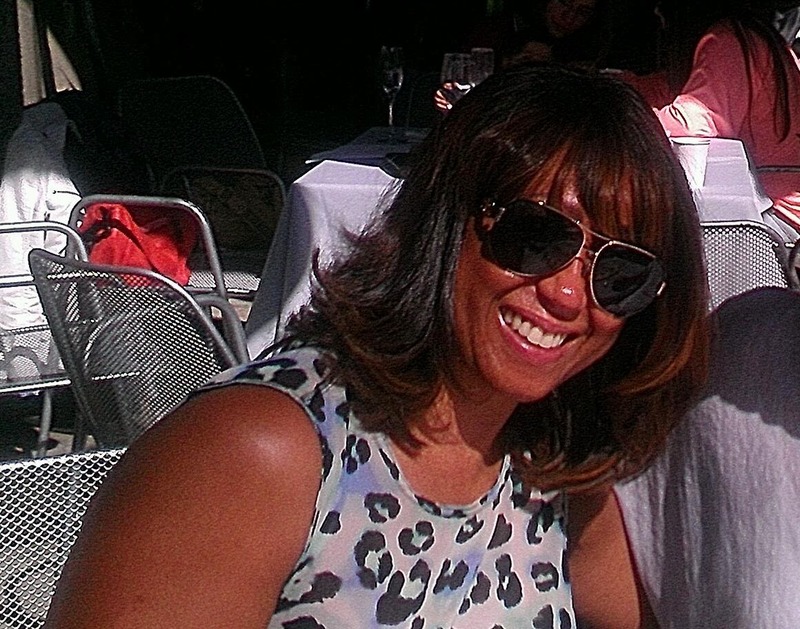 What I lacked in knowledge about Napa or wine was made up by my love for champagne. The great thing is at that time, Domain Chandon provided an in-depth immersion into wine making through their tours which included the historical and geographical regines of champagne, a review of wine, chemistry of making champagne and wine, bottling, riddling cellars and of course ... the tasting. 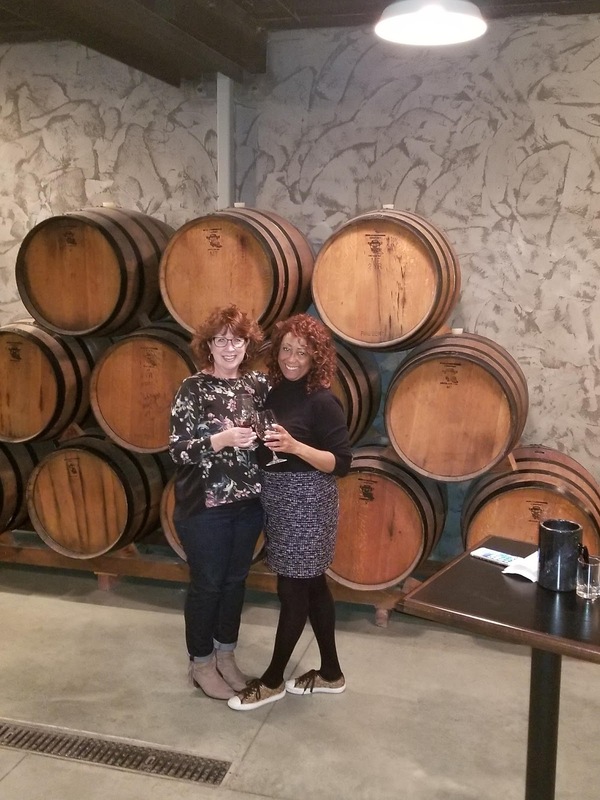 I immediately knew I was in my zone... the fine art and science of champagne or sparkling champagne and wine making...very sweet spot! Fast forward several years, wine memberships and life changing events have evolved and I find the wineries have evolved past education and thrust into escape and entertainment. A large section of wineries instead of providing knowledge they provide an escape from your life and a means to entertain. 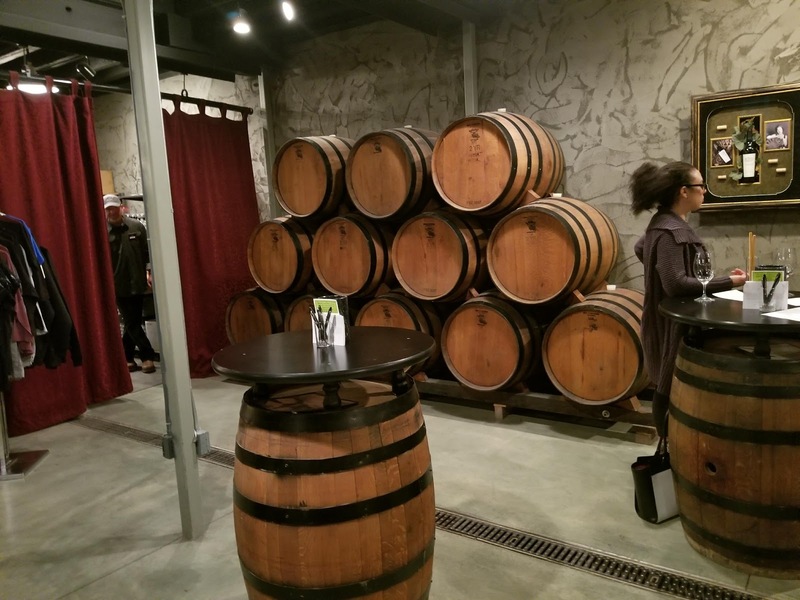 Wineries resemble "lounges" or sophisticated bars...with the only thing offered is a chance to get drunk and sell wine and memberships. Which in most cases people cancel once they reach the sobering reality of their homes...and budget. Now, before you write me of as a critic or judgmental wine snob I was taken to a place that encompassed all three Es and then some. 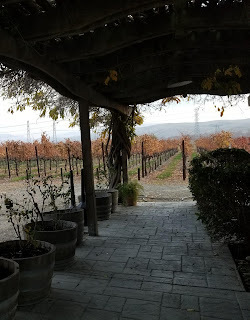 Steven Kent winery in the City of Livermore embodied all three Es effortlessly in a casually elegant manner. From the moment you enter the grounds you are greeted, reservations recommended, by the hostess and the escape begins by whisking you into an entertaining educational experience. One pour after another you escape into a world full of flavor and nuance from whites to reds. 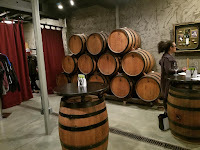 Each guests is invited to escape guided by a knowledgeable wine expert. I was lucky to share this experience with my longtime friend Cheryl Terbeek and her husband Eric...who just happened to be our guide. Cheryl, Eric and I have a history with wine...not just consuming, but sharing ideas, recipes and conversation. I was lucky to have such a knowledgeable guide and friend to expose me to a new winery and for me an undiscovered wine realm known as Livermore. The grounds were majestic and for me an easy place to get lost taking pictures, relaxing and purchasing from their shop. 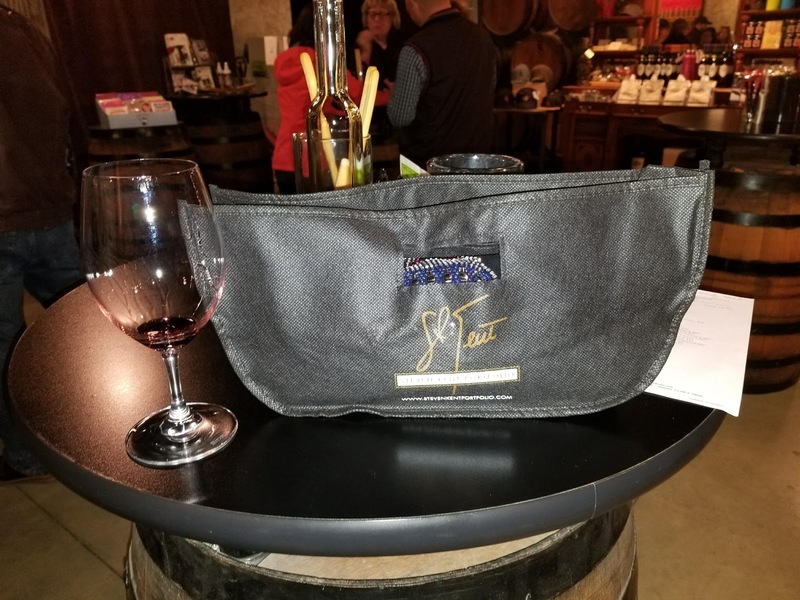 The wine was delicious, easy on the palette, flavorful and beautifully packaged for the ride home or a gift. Nah, this bottles for me...lol. Where's the food you might ask? Its a food blog, right??? Well, in my book and I think Shakespeare, "..wine is the food of the Gods ... so drink up, enjoy, share and remember to do it with love. 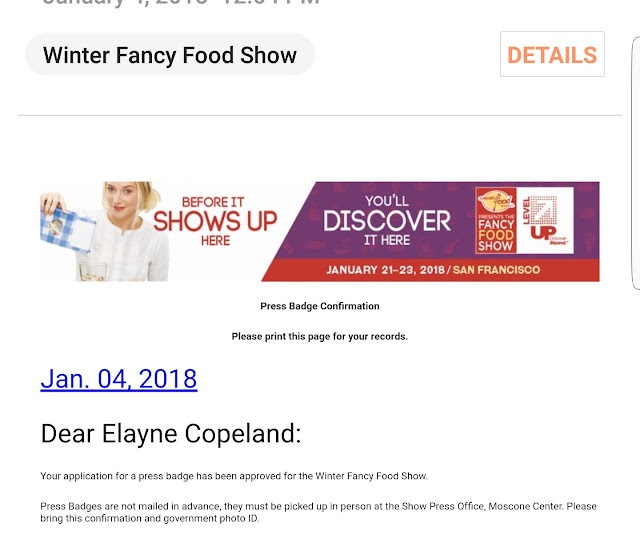 2018 Fancy Food Show here I come! I'm super excited that I was approved for a Press Pass to the Fancy Food Show this year in San Francisco! What does that mean? I'll be able to attend the show and conduct interviews, write articles, maybe a little vlogging...which will be new to me. Look for upcoming article this month shortly after the show in January. 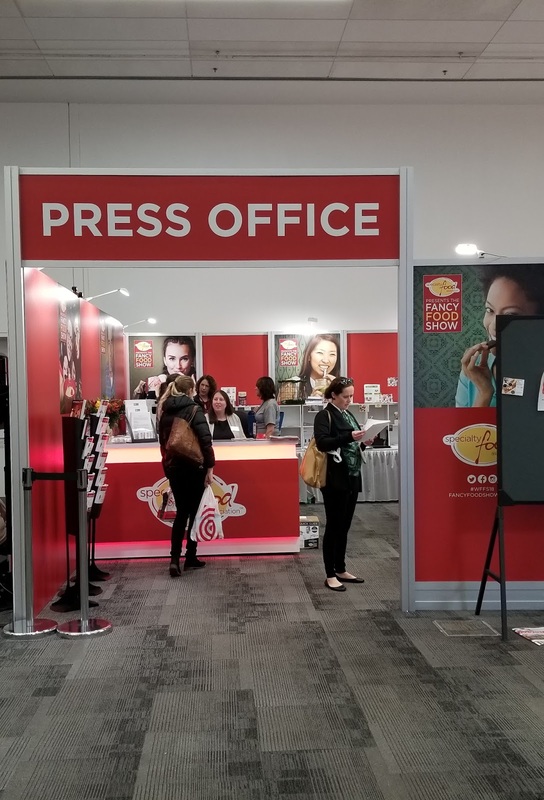 For the LECooks longtime readers, I've attended the show before and featured articles, but as an attendee, not an actual Press Pass. Thanks to Chef Mimi for encouraging me to move in this direction. Looking forward to what this opportunity may bring. Until then, remember ... Cooking with love makes any recipe taste better. Its been one long year of reflection, growth and of course cooking and writing. Most of the cooking for 2017 was a balance of between eating healthy and cooking for my Man. A challenging balance to say the least...one day fried chicken the next day salad...lol. However challenging, the year of cooking was filled with joy, memories and a very happy Man after each meal. I've risen from my euphoric incubation and started cooking and writing again. First up, the Christmas Eve cake. A long standing favorite ... 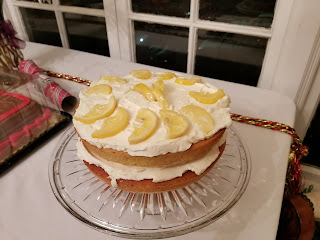 Lemon Cake, but this year instead of the heavy sugary frosting of butter and powered sugar I found a light delicious alternative made of whip cream and cream cheese. Now, you might think that the combination of whip cream and cream cheese would be heavy on the tongue, palette and stomach for that matter...but somehow in the magical world of culinary science, the whip cream cuts the heaviness of the cream cheese and surprisingly very little sugar is used and instead of a dense, rich, sweet cake frosting a light, fluffy, melt in your mouth goodness engulfs your tastes buds. Next up was the annual making of the Galette. I made two, of which both received rave reviews. I ventured in a different direction for both...well, in a way. I continued with my classic Julia Child/Jacque Pepin Galette basic recipe, but instead of sweet apples, like Pink Lady or Macintosh, I went ultra classic with the Granny Smith apples. Shocker! I haven't used Granny Smith in ages wanting to introduce more "flavor" into the recipe by using alternative selection of apples. Gotta admit there is something about the taste of the classic tart, crisp Granny Smith apple that blends so well with a buttery flaky crust of a Galette. From now on ... classic Granny is the way to go for me. (Sorry, no picture). My Mother, Grandmother and Great Grandmother all made, baked and ate Mincemeat pie and I'm no exception. This year however was a game of "see who can find Mincemeat first". Thank goodness I started my hunt early. After 5 grocery stores and wandering down countless aisles scouring up and down baked goods to canned stuff the game of "find the Mincemeat" was off to a very sad start. No one had a single jar in stock. One very nice person said, "...we have freeze dried...", she said sheepishly. Before, I responded I cringed at the thought and took the small package in my hands examining it for all it's flaws. The condensed version of already dried fruit left me speechless...and I'm rarely speechless. I politely handed the package of freeze dried fruit concoction back to the sales clerk and said, "I just can't" and bolted from the store like it was on fire. I ran home determined to make the Mincemeat myself. The recipe is simple, but wholly cow...that's a whole lotta dried fruit!!! Not the most budget friendly filling, unless you buy it premade. I forged onward to the great search guru in the sky...Google. Thank goodness for the supreme being named Google. A mere search on the web with the words "near me" revealed only specialty stores or places where "old folks" shop had Mincemeat. Well alrighty then. I called the local Piedmont Market and inquired if they actually had in their possession a jar of the precious mixture. Gratefully, they did ... "... several jars...", she said. I flew as fast as my little Kia would take me and bought a single jar. Why not more? I didn't want to deprive another person if they too had been on the great Mincemeat adventure as well. Onward. 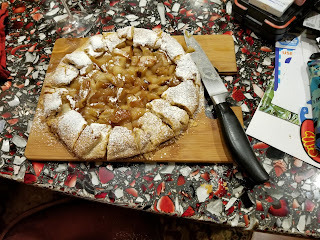 The Mincemeat Galette was the easiest and flavorful pie full of raisins, apricots, ginger...just to name a few coupled with the most important ingredient..RUM. With a side of ice cream its a warming and filling dessert, just what the season requires after a meal of roast beef, lamb or turkey with all the trimmings. I highly recommend this fruit pie alternative. 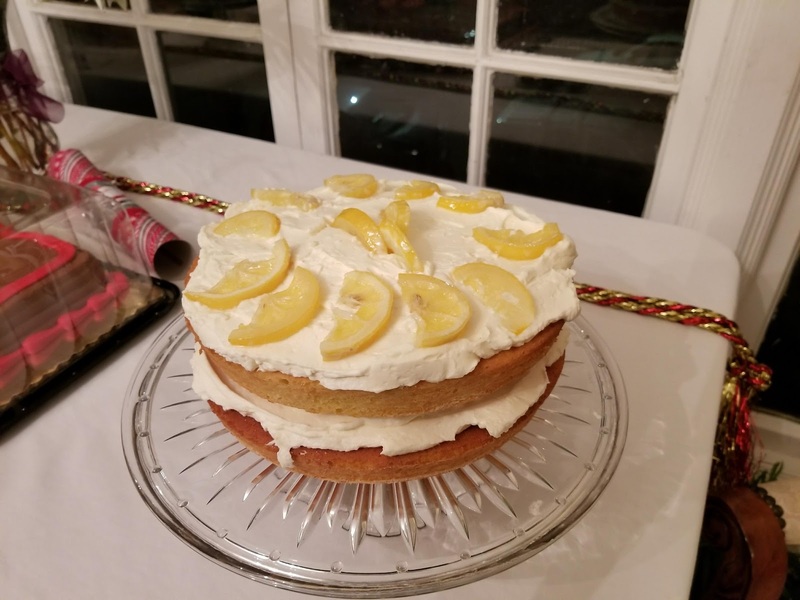 Last up, Mothers NYE cake aka Mommies' Birthday Cake which actually turned out to be a homage to the Mincemeat Galette minus the "Where's the Mincemeat" game. First of all, I have a confession. Yep,...I used boxed cake mix. When it comes to my Mom's cake I don't take chances and by now I'm exhausted and baking a cake from scratch wasn't my idea of fun. But, the idea for the cake was brilliant. Sacrilege, you might say, but it's a life and time saver. I used white cake mix and added a teaspoon of vanilla extract in the batter before it's baked. 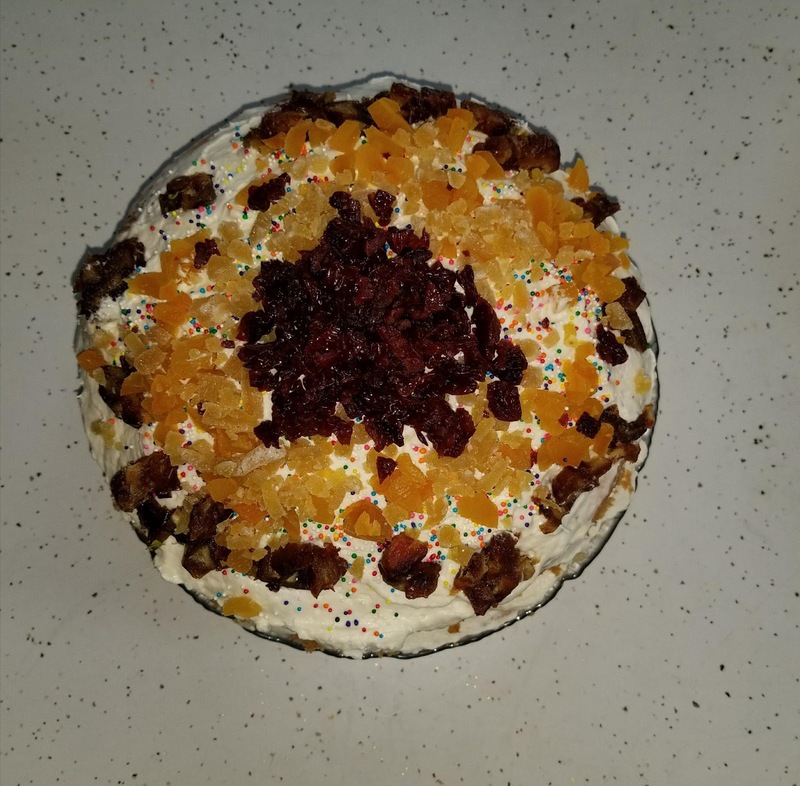 I used the same whip cream-cream cheese frosting, but a confetti of dried fruit on top made of dates, candied ginger, apricots, cranberries. Oh, and the surprise was a thin layer of fig jam spread on each layer of cake. It added a savory sweetness to the cake without being overpowering. Before the fruit is placed around the top of the cake I sprinkled a random layer of candied sprinkles. If you look close you can see them. Subtle, but just the extra something to add to the festive occasion. With all that going on ... was the cake any good? All I can say is ... Its gone. I even ate a slice and was very sorry I didn't take a second slice to go. Fun alternative and very New Years Eve looking. I'm back my friends and exploring our love of the culinary arts on a new level...more to come on a monthly basis. Even might explore healthy options to post. The important thing to remember whatever the option ... cooking with love makes any recipe taste better. Nothing says Christmas like a warm smile, snowflakes and holiday cookies. This year Lady E Cooks took a long break for a variety of reason...but I'm back to baking starting with Christmas cookies. 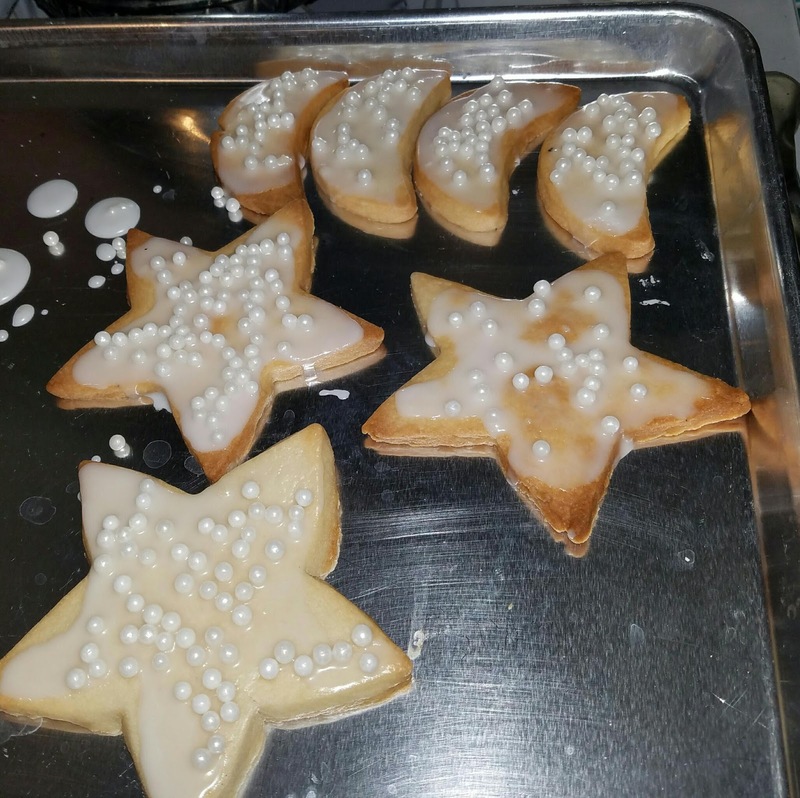 Sugar cookies have to be the easiest and most versatile recipe on earth. One, because of the limited ingredients and two...no leavening agent. Nope, no eggs to bind, no baking soda or baking powder ... so, if you're out of those, but have the basic ingredients below you can create a variety of tasty treats for friends and family. Most of all you can be as creative as you want... top with jam, cream cheese frosting, sprinkles, no sprinkles and they are suitable for any special occasion. Just imagine to your hearts content. Follow any sugar cookie recipe...making sure the butter is at room temp, the vanilla has lots of flavor and put in fridge to chill once combined to firm up the dough for at least 30 minutes. Roll out dough and form cookies with cookie cutters. Once baked and cooled...around 12 minutes allow to cool. Frosting was inspired by the Christmas Eve champagne I was sipping. Put powdered sugar in stand mixer and pour two tablespoons of champagne into bowl and mix on low, then increase speed to blend. Use a small spoon or teaspoon measure to pour frosting on cooled cookies. I tried dipping then, but just a bit messy for me. Before frosting hardens place candy on top either randomly or strategically. Be sure to drink a little less of the champagne as the night progresses...or the cookies become a hot mess and the 1/4 teaspoon measures get caught in the garbage disposal like mine did. All in good fun and cheer. When that happens .... it's time to turn in and fix the issue in the morning light. LOL! Merry Christmas to all and may your spirits be bright on this beautiful Christmas Sunday. Remember cooking with love makes every recipe taste better.